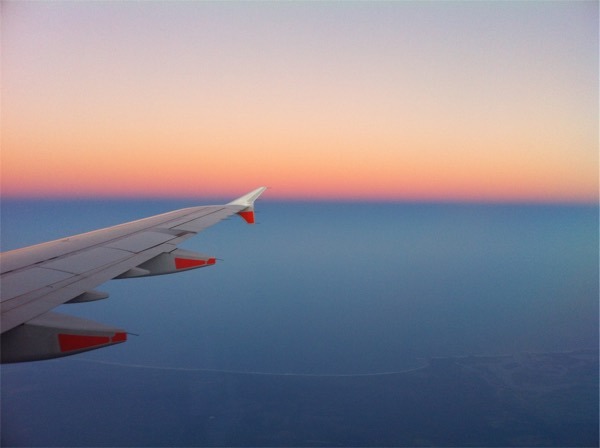 In this post, we outline which routes to find it on, and what to expect from the new Suites and Business Class products. 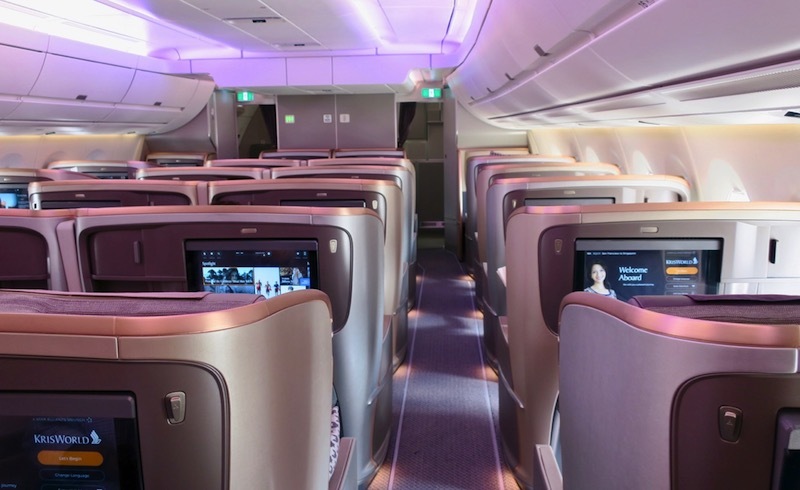 Singapore is also introducing a new regional Business Class product on new Boeing 787-10 Dreamliner aircraft. 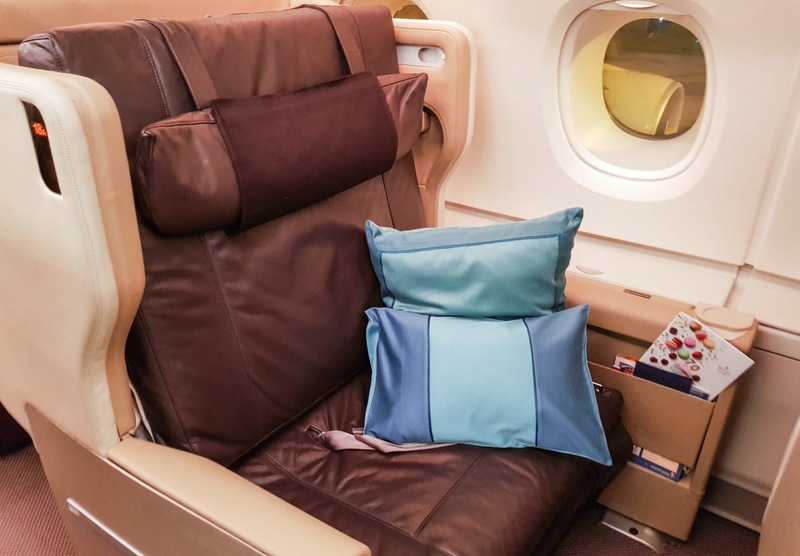 Just like back in 2007 when Sydney was chosen as the launch route for Singapore’s A380 aircraft, it will also be the first destination to enjoy the upgraded seats. The flights you want to aim for are SQ232 departing Sydney for Singapore from 19 December, and SQ221 departing Singapore for Sydney from 18 December. Update: London and Hong Kong have now been added, with Shanghai and Zurich slated to commence on 2 August 2018. 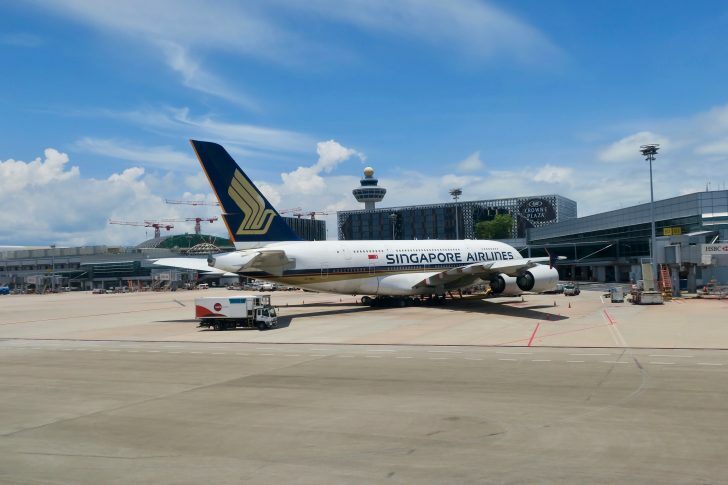 After four years of consultation, Singapore will first install the new seats on its five fresh A380s on order and then its 19 existing A380s. 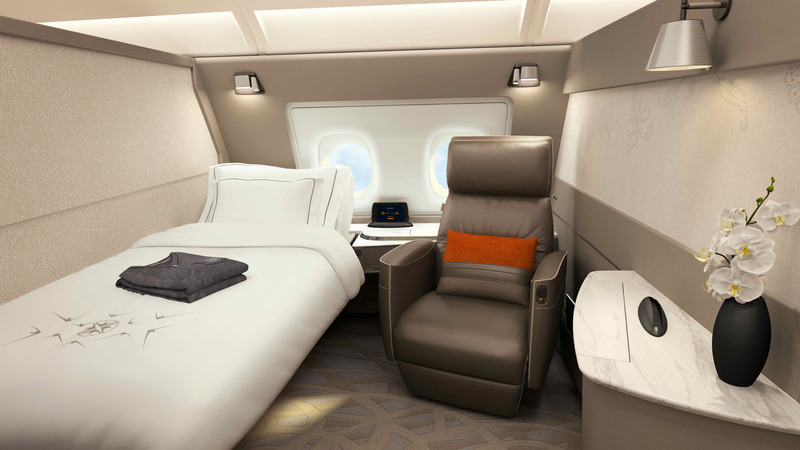 It will give way to half the number of Suites (only six) in 1-1 configuration, following Etihad’s lead with its nine A380 First Class Apartments. Four of the six Suites can be configured into double beds for when you are travelling with a companion but it seems you will not be able to eat near each other as the chairs are located at opposite ends of the combined Suites. 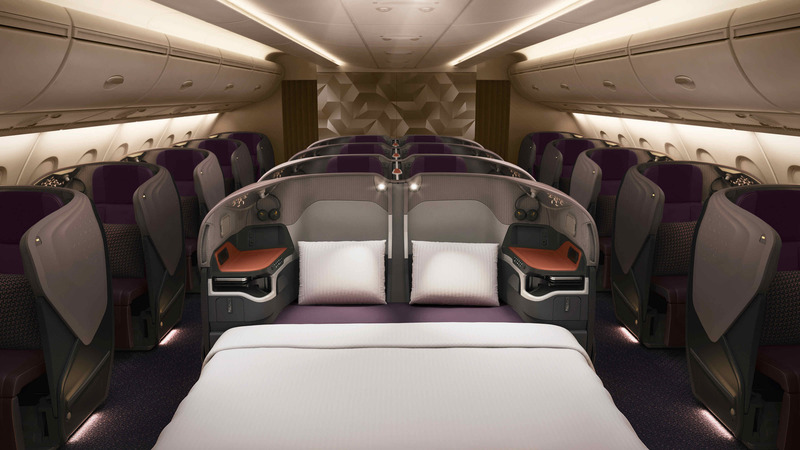 Reports note that the doona in the promotional picture will not actually be available inflight – deceptive marketing. 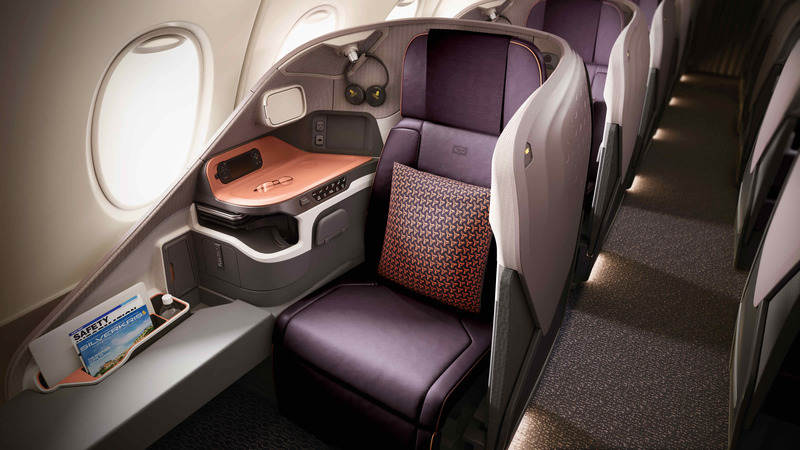 Currently, the newest Business Class product is found on A350 and 777-300ER aircraft, which includes some (but not all) flights servicing Sydney, Melbourne and Brisbane. It is the older A380 product (which is the same product found on the 777-200ER) which will be getting the upgrade. Measuring 25 inches wide, the upcoming product will be narrower than the 28-inch A350/777-300ER seat and much narrower than the current A380 seat, which measures 34 inches. 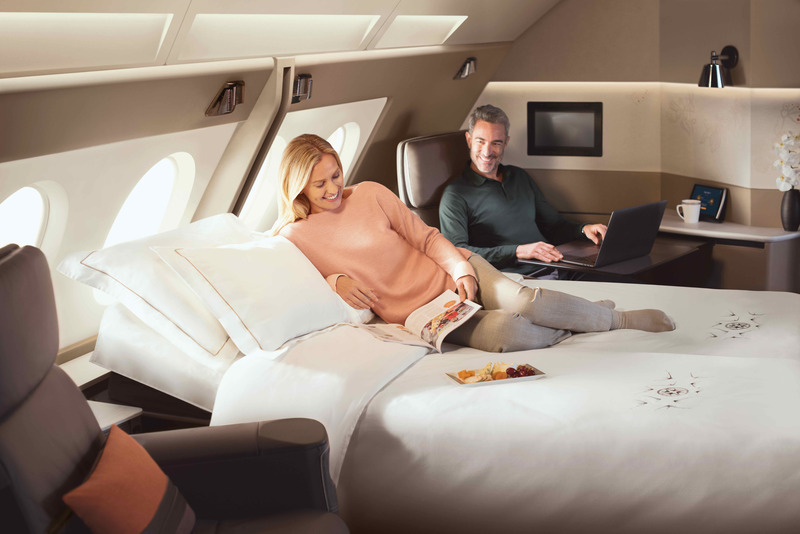 Singapore has taken the double-bed concept from First Class and installed it in Business, with the three sets of bulkhead seats now being able to be joined together – but would you want to be sleeping with your partner in full view of the cabin? 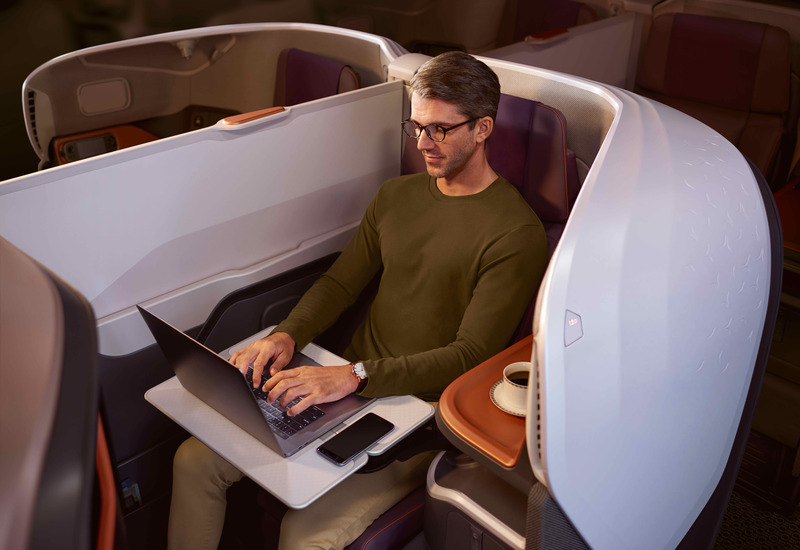 Premium Economy was recently updated and will basically stay the same, while Singapore’s already excellent Economy class will continue to offer 32 inches of pitch as well as add in more lateral back support, an adjustable headrest and a footrest. Whilst the elimination of a remote control in favour of a touchscreen makes technological sense, I always find it annoying when the passenger behind me prods the back of my head every time they touch the screen (I’m looking at you, game enthusiasts!). All up, I think the new products are a mixed bag. 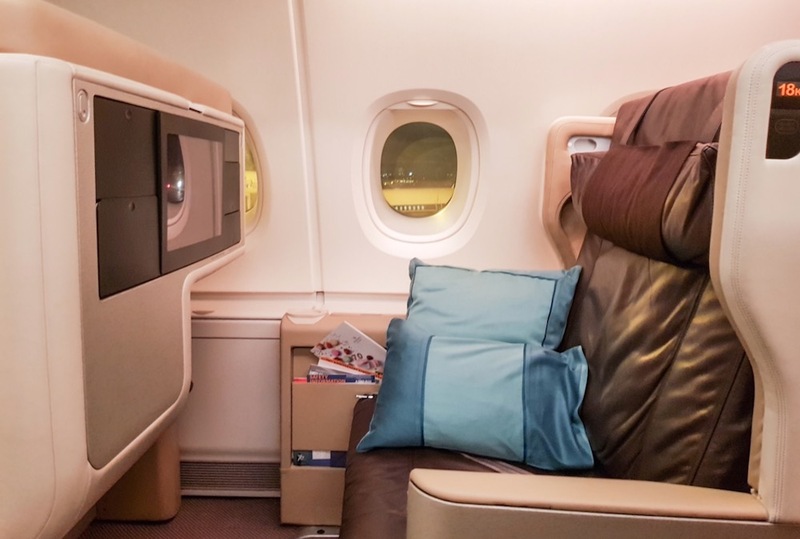 The premium products were definitely in dire need of an upgrade, with more personal space, a separate seat and bed, and a huge TV big pluses for Suites, however, the halving of the number of them will make this redemption less accessible to points enthusiasts like us. 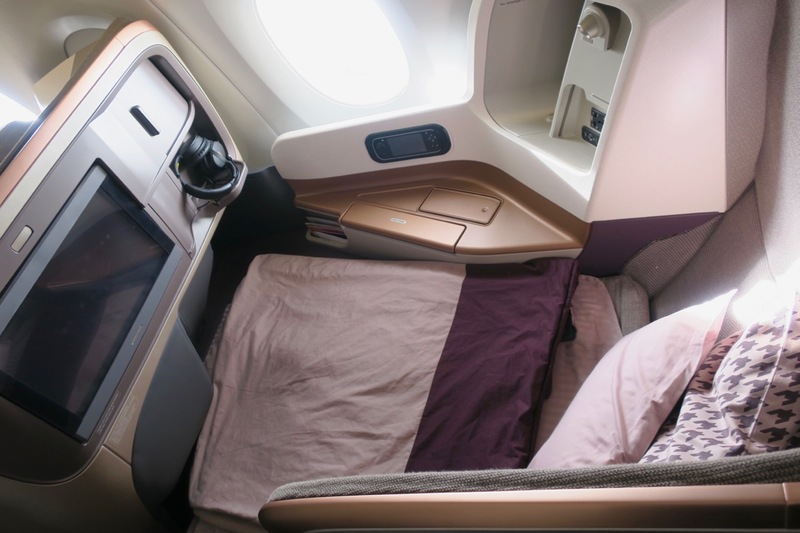 While the cosmetic upgrade of the current A380 Business Class seat looks great, I think Singapore has missed the opportunity to install closed-door seats and a more comfortable bed. That being said, if you are looking at travelling to or through Singapore on Singapore Airlines using your KrisFlyer miles or Velocity points, then I would recommend aiming to book onto one of the flights earmarked to be flying the new products from December to try them out. What is your take on the new products? Share your thoughts in the comments below! I know it says they’ll be rolled out progressively to 2020…Do i take the risk of getting the old A380 seat!? Hi Curtis, there are no indications of it being rolled out to Melbourne as of now, so you could either take the risk of getting the older A380 seat (and it potentially getting upgraded to the newest product) or book a pretty modern seat on the A350 or 777-300ER. In flying sq231, is this the new first class? I made sure I was getting the new one over the phone but reading this it sounds like I’m not on the right a380. What you can do is go into Manage Your Booking and check the seatmap. If there are 6 seats, it’s the new product; if there are 12, then it’s the older product. ahh awesome thanks for the reply! looking at the manage your booking its the 12 seater 🙁 i’m gonna call up and see if they can change my booking as it’s for August, maybe i get lucky. Also playing from shanghai to singapore by business class, do you know which flight i need to get the newest business class seats? thanks Matt! I don’t think that Shanghai is being served by the new Business Class but do try to get on a 777-300ER or A350 for the second-best. Tested the new business class seat out a few weeks back. While it’s a beautiful design in many ways, for a tall flyer with large feet, it’s a marked step backwards. At 6’5, there is no way to get into a comfortable sleeping position – the narrow size of the foot space is terrible. I understand that due to my height the length of a lot of seats will be an issue, but reducing the foot space really kills this seat for me for anything other than day flights unfortunately. Interested as to whether two people can share the suite for the price of one. No to all of those. One Suite = one person. Passengers in other cabins would not be able to enter a Suite. 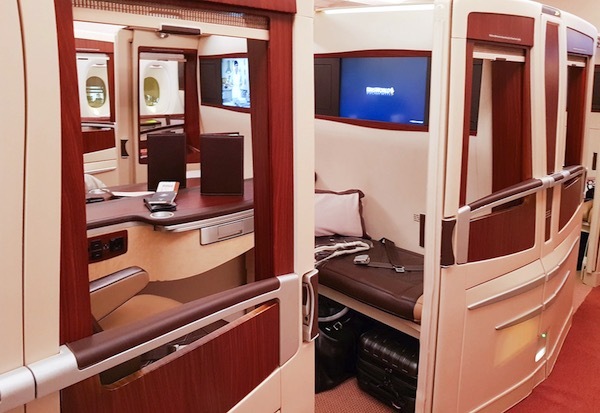 My husband and I are lucky to have nabbed award seats for the new Suites in January to Singapore – however it isnt very clear which of the seats can actually be combined into the double bed. Is it 1A and 2A, 2A and 3A etc or just two specific suites? Congrats! It’s 1A and 2A together, and 1F and 2F together. Errr… no. 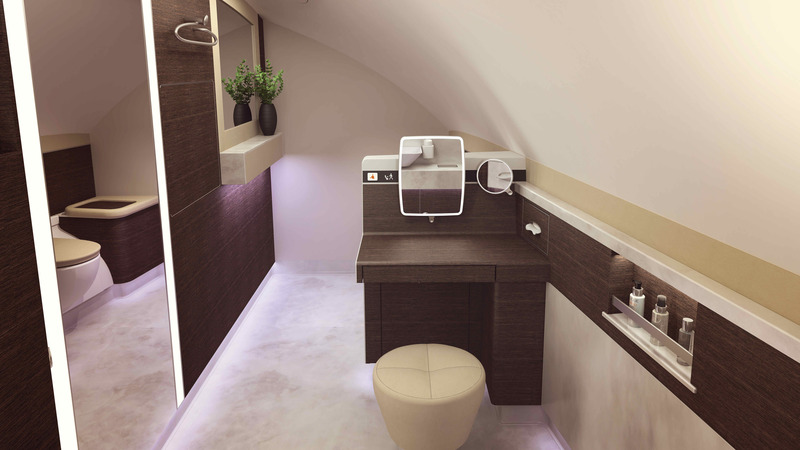 The Stelia seat is what is planned for the regional (midhaul) 787-10s. Not long haul A380s. did you guys manage to grab a media invite for the 2 Nov reveal?